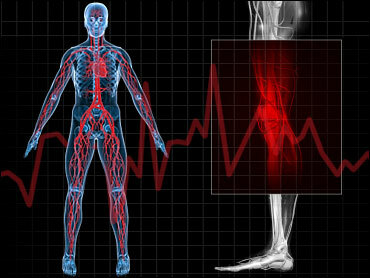 Far too many Americans are dying of dangerous blood clots that can masquerade as simple leg pain, says a major new government effort to get both patients and their doctors to recognize the emergency in time. "It's a silent killer. It's hard to diagnose," said acting Surgeon General Dr. Steven Galson, who announced the new campaign Monday. "I don't think most people understand that this is a serious medical problem or what can be done to prevent it." At issue are clots with cumbersome names: A deep vein thrombosis, or DVT, forms in large veins, usually a leg or the groin. It can quickly kill if it moves up to the lungs, where it goes by the name pulmonary embolism, or PE. These clots make headlines every few years when seemingly healthy people collapse after long airplane flights or being in similarly cramped quarters. Vice President Cheney suffered one after a long trip last year. NBC correspondent David Bloom died of one in 2003 after spending days inside a tank while covering the invasion of Iraq. But that provides a skewed vision of the problem. While there aren't good statistics, the new surgeon general's campaign estimates that every year, between 350,000 and 600,000 Americans get one of these clots - and at least 100,000 of them die. There are a host of risk factors and triggers: Recent surgery or a broken bone; a fall or car crash; pregnancy or taking birth control pills or menopause hormones; being immobile for long periods. The risk rises with age, especially over 65, and among people who smoke or are obese. And some people have genetic conditions that cause no other symptoms but increase their risk, making it vital to tell your doctor if a relative has ever suffered a blood clot. People with those factors should have "a very low threshold" for calling a doctor or even going to the emergency room if they have symptoms of a clot, said Galson, who issued a "call to action" for better education of both consumers and doctors, plus more research. But here's the rub: Doctors are ill-informed, too. For example, studies suggest a third of patients who need protective blood thinners when they enter the hospital for major surgery don't get them. And patients can even be turned away despite telltale symptoms, like happened to Le Keisha Ruffin just weeks after the birth of her daughter, Caitlyn. Ruffin made repeated visits to doctors and emergency rooms for growing pain in her leg and groin in December 2003 and January 2004, but was told it must be her healing Caesarean section scar. Finally one night, Ruffin's husband ran her a really hot bath for pain relief - only to have her climb out minutes later with her leg swollen three to four times its normal size, and then pass out. "I like to call that my miracle bath," Ruffin said, because the sudden swelling proved the tip-off for doctors. Pieces of a giant clot in her right leg had broken off and floated to her lung. The ER doctor "said if I hadn't made it in when I did, I may not have lived through the rest of the night," recalled Ruffin, now 32, who spent a month in the hospital and required extensive physical therapy to walk normally again. These clots "tend to fall through the cracks" because they cross so many areas of medicine, said Dr. Samuel Goldhaber, chairman of the Venous Disease Coalition and a cardiologist at Boston's Brigham & Women's Hospital. With the surgeon general's campaign, "DVT after all these years will finally get the national spotlight like cigarette smoking did in the mid-60s," he said. The Agency for Healthcare Research and Quality is issuing a 12-page booklet to help consumers tell if they're at risk for DVTs and what to do - and a 60-page DVT treatment-and-prevention guide for doctors and hospitals. As a prevention incentive, starting Oct. 1 Medicare will withhold payment from hospitals when patients develop the clots after knee- or hip-replacement surgery.